For some, learning how to save $500 a month may not seem like a monumental task. For others, saving $500 per month seems impossible. However, saving 500 dollars per month is achievable if you challenge yourself to meet the goal. You may have to use a bit of creativity and put in some hard work to make it happen, but there are many easy ways to save money each month. Sometimes figuring out how to save $500 in a month is as easy as making a few changes in your finances. 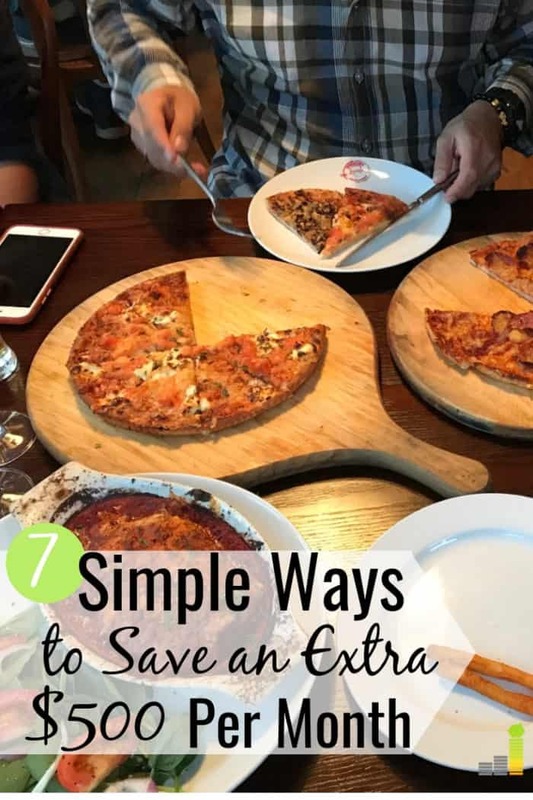 Other times you’ll have to cobble together a handful of money saving tips and tricks to make it happen. The key saving $500 a month is taking action. Ultimately, answering ‘how much should I save per month?’ is something you have to decide on your own. However, if you aren’t saving anything, please don’t think it’s difficult to begin saving money. While the ideas below can help you reach a savings goal of $500 per month, they can be used for other savings goals, too. Here’s how you can save money each month with a few simple actions. The easiest way to start saving money is tracking your spending. When you track your spending, you write down every time you spend money. The amount doesn’t matter; you just want to know where every dollar goes each month. Tracking your spending lets you see where you’re overspending and where to find savings opportunities. This may sound tedious but it’s quite simple once you automate it. Tiller is a great option to use to automate downloading all your financial transactions. It connects to your bank accounts and updates a Google sheet with your daily transactions and balances. This allows you to track your spending using any budgeting categories you want. Once you set up your Google sheet, you can even automatically categorize your expenses. This makes tracking your spending even faster. But how does tracking your spending help save $500 per month? Once you start tracking your spending, you realize exactly how much money you’re spending in every category each month. Sometimes, this results in some pretty disturbing realizations. You might realize you’re spending $1,000 per month on groceries and dining out for two people. You could realize you’re spending $500 per month in subscriptions you don’t use. Start earning more on your savings right now with CIT Bank. They pay 2.15% interest on your balance when you commit to depositing at least $100 per month into your savings account via ACH. Plus, they charge no fees, which helps you save more money faster. After tracking your spending for a month or two, look at how much you spend in each major category. Then ask yourself if your spending aligns with your values for how you’d like to spend your money. If your values and your spending don’t line up, cut back in areas where you spend more than you value. When looking over the expenses that you’ve tracked, make sure you look for expenses that provide little to no value, too. Eliminate these expenses and put that money toward your $500 per month savings goal. Cable bills can get ridiculously expensive, and it’s rare to use all of the services you pay for. With the average monthly cable bill hovering around $110 per month, cutting the cord can easily save $60 (or more!) per month. You won’t have to miss out on anything, either. You can get the same content with one of the best cable TV alternatives. One of the best options for cable TV alternative is Hulu. Currently, Hulu is just $5.99 per month for your first year then $7.99 per month after the first year. If you’re paying $100 or more per month for your cable subscription, that’s an easy savings of $92 or more. You can get Hulu with Live TV for $39.99 per month if you still want live TV content. Even though the cost is higher than regular Hulu, it’s a savings of at least $60 per month. If you want to see if it’s for you, Hulu offers a free seven-day trial to check out the service. And make sure you check out our Hulu with Live TV review to get a complete breakdown. If you don’t feel like cutting the cord, try to negotiate your current rate. Many companies have discounts available if you simply ask for them. Every year when my promotional offer runs out, I call Comcast to sign up for a new promotional rate. This always saves me at least $20 per month. If I didn’t call to negotiate a lower rate, I’d lose over $200 per year. This tactic can be used for other bills and is one of the best ways to save money every month. Try negotiating your gym membership, Internet bill, medical bills, credit card interest rates, cell phone bills, car insurance rates, security system rates, and even your rent payment. You may be surprised what discounts you qualify for which you can then apply to your goal of saving $500 per month. Unfortunately, not all providers will negotiate or give discounts. In fact, some companies refuse to give discounts to loyal customers and instead they slowly increase prices over time. So what do you do if you can’t negotiate your bills with your current providers? Get quotes from competitors to see if a better rate is available elsewhere. Shopping your major bills with competitors is a smart thing to do regardless of whether or not your current providers give you discounts. In fact, it’s easy to obtain quotes for big bills like homeowners insurance, renters insurance, and car insurance. Simply visit a website such as Allstate, input some information, and get a quote. If you find a suitable provider that offers a much lower rate, you could easily save hundreds of dollars per year just by switching your insurer. The average person saves over $350 per year when they switch auto insurance alone, so there is opportunity to save more money each month. Make sure to get quotes for all your big bills where your lender has competitors. You never know how much money you could be saving each month. Using a few of the best cash back apps is an easy way to add a little bit to your savings without much effort. Simply sign up for a cash back app like Ibotta. Then, add offers within the app, go shopping and take a picture of your receipt to get cash back. Adding that cash back to your savings account brings closer to reaching your $500 per month goal. Ibotta works at grocery stores and over 350 retailers so you can earn cash back when you buy anything from food to booking travel. Check out our Ibotta review to get a better idea of how you can use the app to increase your savings. Another way to add a bit of extra cash back to your savings goal is by using a cash back credit card. These cards allow you to earn credit card rewards on your purchases. For instance, there are credit cards that give two percent cash back on purchases. If you spend $1,000 per month on your credit card, that’s an extra $20 per month you can save. Here are some of the best cash back cards that let you earn money back on your spending. Just make sure you pay your credit card off in full each month. Otherwise, interest charges will quickly outweigh any cash back you earn. Another way to save money is by refinancing your mortgage. Rates are still relatively low, historically speaking, so this can be a good opportunity to save money each month. LendingTree provides a good way to compare multiple loan offers, up to five, to find the best deal for you and your specific situation. In general, you should only refinance your debt if the total of all new payments and fees on your new loan is less than the amount of the remaining payments on your current mortgage. Otherwise, you’ll end up paying more money by refinancing your loan. Typically, you should investigate refinancing if interest rates have decreased, your credit score has increased, or if you didn’t shop around for the best rates when you originally took out your loan. If you find a loan with a lower overall cost, you could end up saving hundreds or thousands of dollars every year. If cutting your expenses and negotiating your bills doesn’t result in enough to reach your $500 per month savings goal, it’s time to start making more money. Earning extra income could be as easy as picking up extra shifts at work. If you’re in a salaried position, try to increase your income through options at work like promotions, raises, or bonuses. Sometimes, you might even need to look for a higher paying job. If that’s not an option, try earning extra money outside of work. There are many ways to make money on the side to help supplement your income. Look at the skills you have that could be valuable to others and use those to earn some extra cash to put toward your savings goal. Just remember that you’ll have to pay taxes on the extra income you earn. Make sure you account for that in your savings plan. Saving $500 in one month is pretty awesome. However, to reach your financial goals, you’ll need to continue to save $500 every month. Don’t let the initial excitement of saving $500 in one month deter you from saving money each month. In fact, use your excitement to keep going! A great way to continue the habit each month is to automate your savings. This is also known as paying yourself first, and is one of the best money habits you can follow to grow your wealth. Many banks make automating savings easy to accomplish. All you need to do is complete a short form. CIT Bank is one example. With their Savings Builder account, you can earn 2.15 percent (26x the national average) if you open an account with at least $100 and transfer $100 per month. You can have the transfer withdrawn directly from your checking account each payday, the first of each month, or some other monthly interval. Paying yourself first forces you to live on what’s left over each month. You also won’t need to wait until the end of the month to see what’s left over to save. Instead, you’re being proactive and make saving $500 (or more) each month a priority. Saving $500 per month can do amazing things for your finances. After just five years, you’ll have saved $30,000. After 10 years, you’ll have $60,000 saved. You can use this money to buy a car in cash, put a down payment on a house, or put it towards another goal. The options are endless! Of course, you can decide to invest the money rather than save it. If you decided to start investing $500 per month and earn an eight percent return on your money, you can become a millionaire in just over 30 years according to the CNN millionaire calculator. While it isn’t easy, learning how to save $500 per month will make your financial future much brighter. By saving at least $500 per month or more, you’ll better prepare yourself to handle life’s expensive moments. You may not be able to save 500 dollars per month, and that’s fine. However, don’t use that as an excuse to put off saving money each month, especially if you’re not currently saving anything. Look at your spending and find an amount you can commit to saving each month. You will be surprised at how quickly your savings will build and provide a solid foundation for the future. Do you think it’s possible to save $500 each month? What’s one area you struggle to save money on regularly? What do you believe is the easiest way to save money each month? The post How to Save $500 a Month: 7 Ways to Save More Money Now appeared first on Frugal Rules.